There are a lot of kids I know, or that Jack knows, that fall into one of these categories: a) afraid of bugs and critters, b) kill bugs and critters if at all possible, c) try to make all bugs and critters their friends and keep them as pets and inadvertently kill them, d) allergic to bugs and critters. Luckily, LUCKILY, Jack is none of these! None! I think once when he was mad at me he pretended that he was going to squish an ant, and then felt so bad about it he cried his eyes out. My kind of man! Between the two of us, we can’t get enough of being outside, taking hikes, studying little bugs and animals that we find in the woods, etc. Jack now says he wants to be a scientist and he’s always carrying around his magnifying glass and walkie-talkie. If I could only get him to say “over” when he’s done talking… SIGH! The other day, Jack went to our neighbor’s birthday party. She had a critter van pull up! Jack is still talking about the spiders and the one gecko that climbed his shirt. 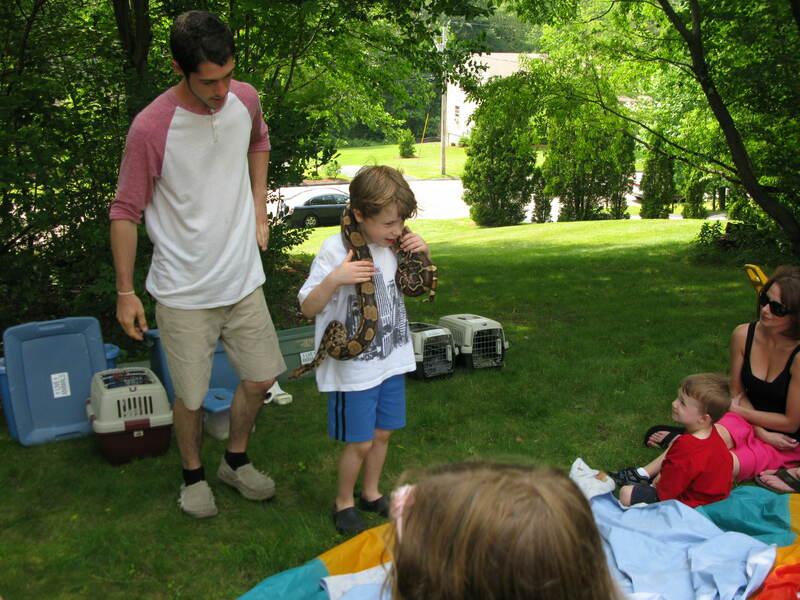 I wasn’t there, but I found out through photos that he even had a boa constrictor (python??) wrapped around his neck at one point. GASP! Jack: The gecko’s name was Roxy. She was a jumper! Jack: Uhhh, it was a SHEEEEE. me: Sorry. Did SHE climb your shirt? Jack: Didn’t you just see the picture? I think you know the answer. me: Jack I’m just making conversation over here. Jack: Less yacking and more packing. me: (thanks for teaching him that, Dad) We’re not packing anything. Jack: Well then just less yacking. 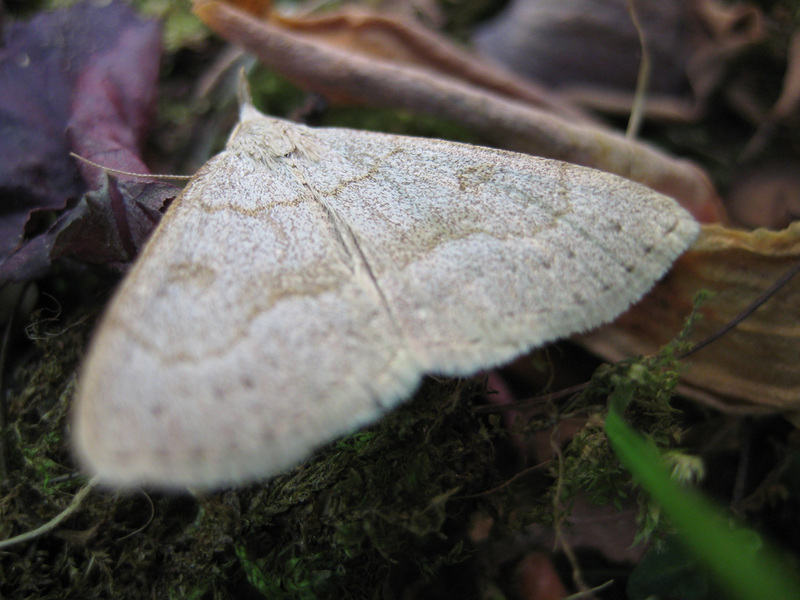 Not sure what kind of moth this is… but it was in our back yard. 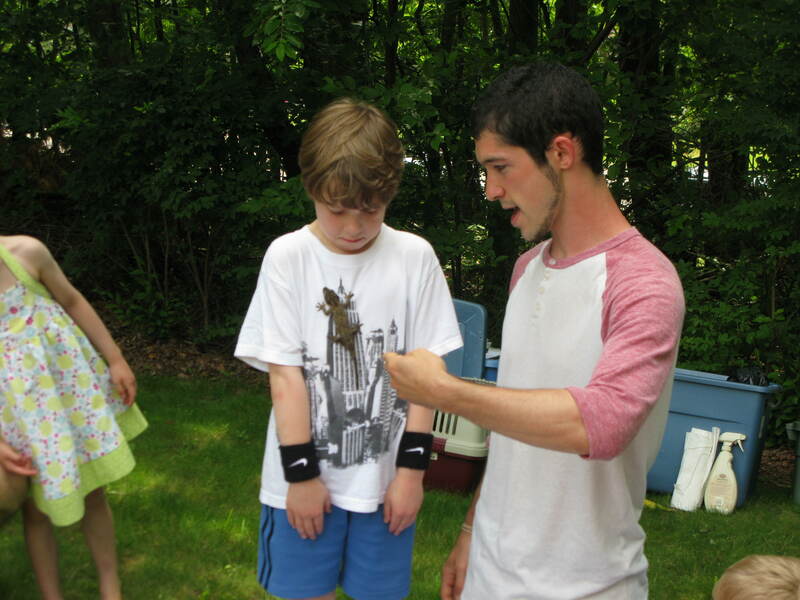 Jack with a gecko climbing his shirt! GASP, giant snake on Jack’s neck. Previous postThe last day of 1st grade! sweet 🙂 some of these creatures i wish to squeeze (niah, niah), but some of them are just… yuck! Jack is 6 years old going on 35. 🙂 I think it’s about time to introduce some small critters into our house (in addition to the cats haha). I think Jack would love to take care of a lizard/gecko/iguana…I’ll have to look into the cost and upkeep. Some of these animals are expensive to own! Thanks for reading! You definitely weren’t making this up lol. My little cousin falls within the category of making every single bug or critter his best friend. Does your cousin also talk to them in the high falsetto voice? Ha ha, I love that! Like: “It’s okay little buggy, I won’t hurt you!” I hear that a lot from Jack. Then his friends come over and squish the ants. Jack just about has an aneurysm! I think it is just awesome that you and your son spend so much time outdoors and that he is being taught to enjoy and respect nature and other life. That is so refreshing! As someone that just graduated with a degree in wildlife biology I think educating children about their environment is sorely lacking but badly needed. Great job! Ohhh, what an exciting degree! (jealous!) Art major here, who wishes she was a wildlife photographer. 🙂 Thanks for the comment. 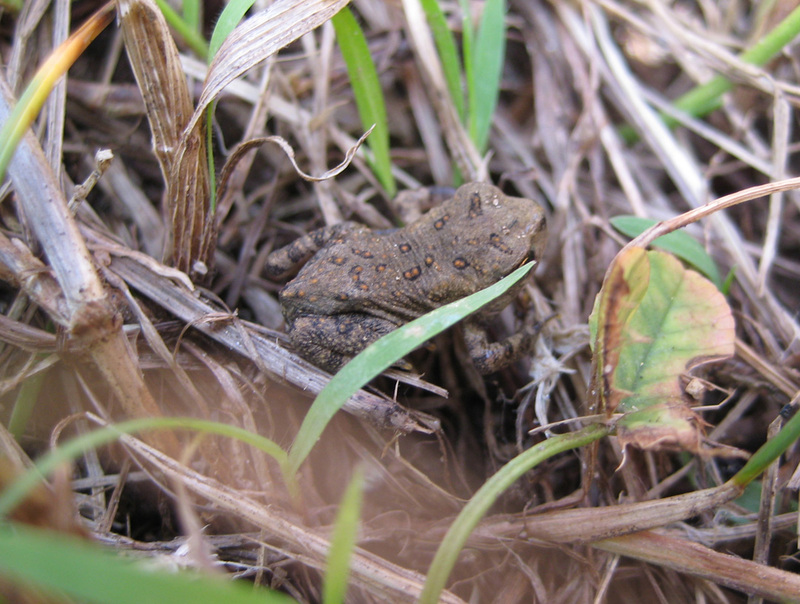 I will definitely continue to pass along to Jack my love and respect for all living things. Jack has an advantage that far too many of his peers will or do not: he’s out in the world, learning about it and experiencing it first hand! Not only are you teaching him to respect his world, you’re also creating a bond that he will surely hold forever dear in his heart. Just wait till decades from now when you get to be out with him AND the grandkids, petting bumblebees and not squishing ants. Wild life is always adventureful.See animal wonders depands on geographical environment. Everyone need life with natural environment when they work free.Blog picture is so beautiful.Thanks for greate post. My kind of people! My friends often tease me about being Elmira off the Looney Tunes cartoon. I wanna hug him and kiss him and squeeze him and love him and…. You get the drift. I’ll take 32 pictures of the same bird doing the same thing, and I have skipped along the beach like a 5 year old when I saw a baby stingray once. I’m 33. Too funny. I don’t envy him with that snake though! Good for you! I would actually be more afraid of neck germs than of the snake choking me. Ha ha! what a cute story though I have to say that I’ve often shrieked when a bit of nature fell on me! Thank you! As much as I am not afraid of most “nature”, I once had a carpenter ant run up my arm unexpectedly and you would’ve thought I was having a seizure! Thanks for the great read today, and congrats on being Freshly Pressed! Thanks so much! I appreciate it very much! Great post and love the photos! Congrats on being Freshly Pressed! I think you have a future biologist/vet in your hands! Very brave boy! Oh I would be so psyched if he got into that line of work. Right now “garbage man”, “owning his own car wash”, and “bison” are still at the top of his career list. Aw that’s cute. My husband has also taught my children to say things I wish he hadn’t like ‘Whatever Minger’ lol……my husband said it as a joke about something, and the kids quickly cottened on lol. Thanks for the nice words! The new buzzword in our house is “lame”. Everyone and everything is soooo lame according to Jack. It’s kind of funny but can get SO annoying after about the 30th time. Ah, gotta love the phases that kids go through. LMAO, mine keep saying ‘sick’. Whoa, that’s so sick. Oh no, I forgot about that one! I’m sure that’s in my future… How old is yours? What else is in store for me? Ha ha! Funny post, I’ll have to look around (I also have a soon to be 6 year old boy and a baby girl). Congrats on FP! Thanks! Isn’t it one crazy ride? Your son is a braveheart. I am absolutely scared. Maybe he can become an animal researcher like the one is Discovery Channel or NGC. That last picture really does look like that sweet little critter is about to meet mr. python, and not in a good way! I enjoyed reading your post & loved the pictures. Jack seems like a pretty cool guy. Cheers right back at you, and thank you very much! Mine are 7 and 4.
erm….our 7 year old used to say ‘bbrrraaappp’ NO IDEA why! None of her friends say it. I can’t think off the top of my head. Our 7 yr old asks LOADS of questions and our 4 year old says embarrassing things or points and laughs at people…..a tad embarrassing! We also get called “Fool” quite a bit. We don’t use that word, so this must all come from school or the school bus! And he now points out people that he thinks are fat. Sigh! Definitely embarassing. Your son sounds like he has an amazing personality and sense of humor. We started taking our 17 month old hiking with us this year and he loves checking out the bugs and wildlife. His nightlight at home is the warming light for his turtle Steve. I can only hope my son enjoys the outdoors as much as Jack. Thanks for sharing! Hi Finally Fast! Your comment went into spam. 😦 But I unspammed it! Thanks for the nice comment. I’m starting to really think we need to get Jack his own little pet. We have 2 cats, but they’re sort of “ours” and not “his”. How does your little guy like the turtle? Great name btw… We named our cat Ed. ha ha. He loves the turtle. Every day he says hi to Steve when he wakes up and night night to Steve when he goes to bed. He can’t quite say Steve yet, he has it down to Steee. Turtles are such low maintenance too (especially if you have a good filter). Definitely on my list of pets! My brother had a turtle named Raphael, of course a ninja turtle, ha ha. I think Jack would love one. He is all boy and that is good! Congrats on being FP! You got that right! 🙂 And, thank you!! We have a 6 yr old boy as well. I can completely relate! Believe me, I was right with you Ohhhh about 7 years ago. 🙂 But seriously, even with all the “sh*t” that goes along with parenting, this is the best thing I ever did with my life. By far! The good will always outweigh the bad, even though my blog might make you think otherwise. LOL! I was the one who carried around water snakes in my beach coat pockets. Gave caterpillars homes in class jars and was a half way house for injured birds. I hoped I carried that love of nature onto my kids. Great post! I hope Jack goes far in life!! And can make a difference! I love your kid’s attitude to yacking! Thanks! The comments are just so random that you have to laugh. Oh! Your boy sounds absolutely adorable! His new catch phrase is cute too–oh, how they pick up things so quickly. My mother’s friend’s six year old likes to say “No offense, Mom, but…” recently. I really enjoy hearing it, she doesn’t. Haha. ur son is adorable and brave! They do! Amazing, eh? I will check out your blog as well. Thanks for reading! I remember loving reptiles as a kid, even as a girly girl at that. Garter snakes, toy snakes, and a friendly king snake were some of my best friends. Good thing there were no poisonous snakes where I grew up! 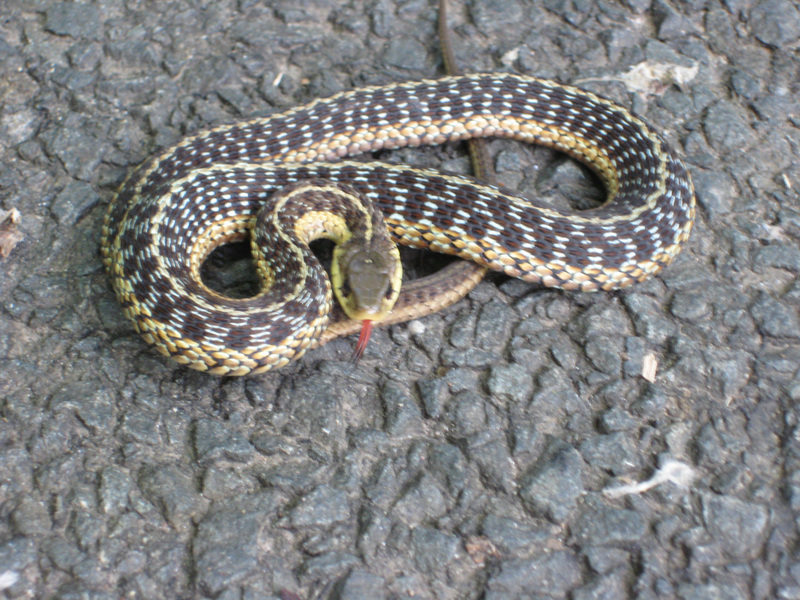 Yes, not too many poisonous snakes here in CT, thank goodness! We do have tons of garden snakes everywhere though. Fun blog with cool pics. I’m not sure about the snake though. It kind of disturbs me. I’m thinking python. Just kidding. Not really. Someone else said python! My husband doesn’t remember what it was, but it looks like it could have choked Jack in a second. My sister has a python of some sort also…that’s a bit too much reptile for me! That’s awesome to have animals adopt you! 🙂 My son gets this from me and my Dad, who has a constant bevy of trained squirrels knocking on our windows for peanuts (he hand feeds them) and blue jays that bring their family members to his yard to meet him! Thank you for the comment! Your post really caught my attention! I remember a birthday party I threw for my son when he was 5 with Jungle Larry and all his animals. I have a similar pic of my son with a lizard on his chest and one holding a snake! Wow what memories you brought back to me. He’s 19 yrs old now…cherish those moments with your son, they go by soo fast! Oh, you got caught in the WP spam filter also. It’s so sensitive! Anyway, I’m glad I could bring back some nice memories. Do you just freak out that you’re the mom of a 19-year-old?? Most of my friends have college-aged kids, and here I am with a 6-year-old. They had a good laugh over it, let me tell you! The years do go by too fast. 😦 Thanks for visiting! My dad said I was the son he always wanted. LOL I am the spider catcher at my school, I raised several baby squire’s after they became orphans in our yard. I am the snake catcher as well. When my boys were small we collected all kinds of animals. Even helped a snake give birth once to a bunch of babies (that’s a long story) And my two cats found me and now are the queens of the castle. Love this post, thanks for bringing back some fond memories of when my boys were this age. Thanks for that nice comment! Funny, but I think I had that same role in my family…as the oldest child AND a girl. I also know all the 70’s wrestlers by heart, but THAT’s a long story. 🙂 Have you blogged about the snake birth? If so, send me the link. If not, then get to it! 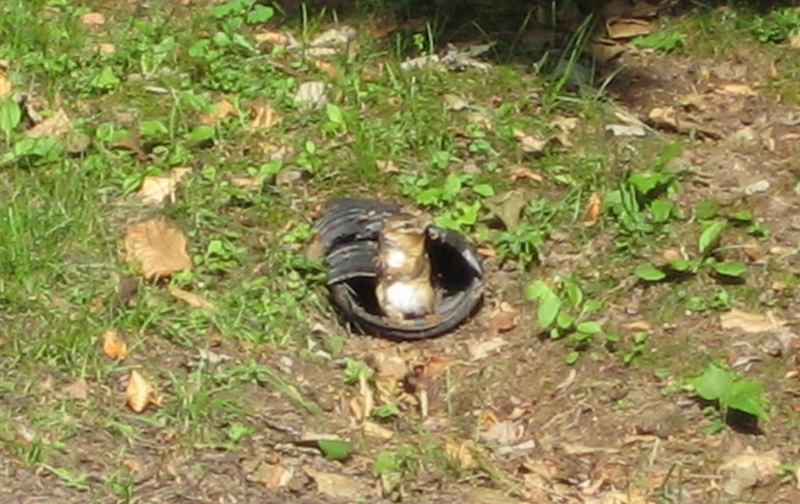 Yeah, I thought that was a snake wrapping around the chipmunk too! Chipmunk looks so cute though! great blog and congrats on being “Freshly Pressed” today! my 3rd child, son, is newly 7. Since I homeschool my kids, we are outside a lot. My kids are still nervous about some bugs (courtesy of their 15 yo brother)…but with some gentle coaching they don’t run screaming from them anymore, and we’ve watched the bees collecting pollen from our flowers, and talked about how good it is for all of us. They’ve taken to turning over rocks and sticks and really exploring this world they are a part of. Laughing at the falsetto voice bug-chatter. Yes! Nice to see another mom with a natural outlook! Thanks very much for the congrats! Wow, 4 kids… Like I mentioned to another visitor…I can barely handle one! I’m in awe of those that go back for more, ha ha. Wonderful blog. Congratulations on being FP. My little ones are grown and in their 30’s now, but they tell me often what a great childhood they had. 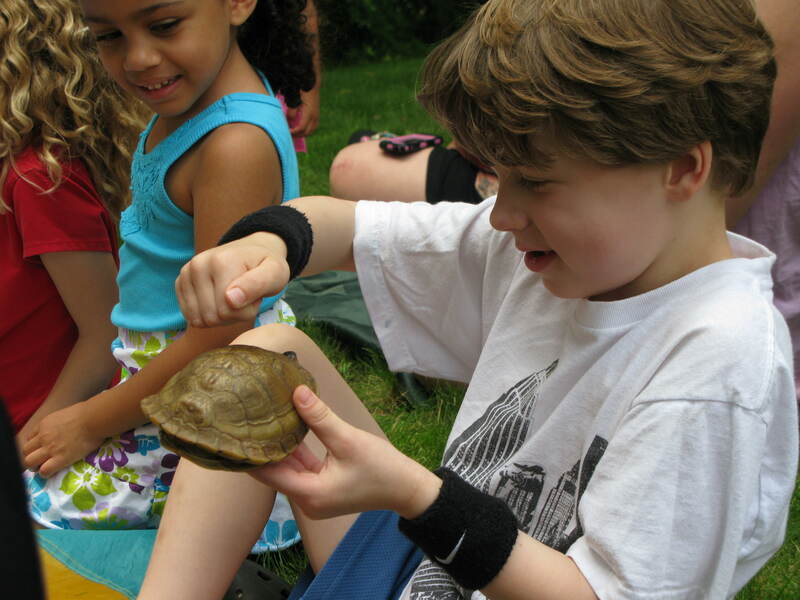 Teaching childern to be in touch with nature lasts a lifetime. After all, you train them to head out into the big world all alone someday. Jack will never forget the lessons he learns from critters. Blessings to you and your family. Oh my…I just can’t believe how your son didn’t get scared by that gecko climbing on his shirt! I always thought gecko and other creatures like that scare the hell out of most people,and if they don’t scare them,they disgust them. And that snake!!! Your son is really brave. Oh thanks for saying so! I would love for Jack to have that type of career. And, as we all know, he’s not shy at all and not afraid to speak in front of a crowd. So there you go! i think you broke down the categories well. My boys are in a nature killing phase, I am sorry to say. My only “eeks” are spiders — because I am allergic and get huge welts — and moths (!) because they tend to fly into my face for some reason, and I hate that. Reptiles I have always enjoyed, though! Really enjoyed reading this blog! The photos go great with it too. The only criticism I have is, could you edit the spelling error? In the second paragraph instead of squish AND ant, it should be squish AN ant. Sorry, my inner editor gets the best of me. GASP, a … TYPOOOOO??? You have no idea how picky I am and what with the giant swelled head I have from all this attention, it got right by me! Hold on, going to fix typo now! Thanks! No one else pointed it out. Kind of like having something in your teeth! I know how you feel – my son-in-law collects tarantulas… It’s a good thing to let children explore – encourage it. I will continue to encourage…and thanks for reading!! I love the nature and those beautiful pictures! Ugh, my students are all the befriending bugs then accidentally killing them type. They also take it a step further and try to befriend larger animals. They kill them too. We need a lot more scientists so I hope he sticks with it. My nephew has had a real interest in science since he was really young and at 15 he still has it. Great to encourage such inquisitive thought! I hope he sticks with it too! But you never know what a child will latch on to when they grow up. Very excited to see what Jack ends up doing with his life. jack you are so brave!!! He reminds me of Victoria and Joey! They both love animals too! We just spent 1 hour saving snails today at Lion Country Safari. It rained and the sidewalks were covered with them! They couldn’t stand to have anyone step on them! Awwww… I hope you enjoy! Great post! but snake looks awesome. The photo with the lizard makes me thing Godzilla conquers Metropolis. Funny you should say that, every time I look at that moth photo I think “Mothra”! LOL! Ha ha love it! I know you don’t want to hear certain things come out of your son’s mouth but “more packing, less yacking” is pretty funny, you have to admit. Jack is my kind of guy! I remember being his age and getting to hold “Beauty”, the Boa Constrictor at the nature museum near my home. It made a positive impression on my life. Great you’re teaching Jack to respect all living things and not just the human kind! Thanks for your blog. Reblogged this on Megan Silva Weblog.